Chiesi completed a long-term clinical study with its extrafine fixed-dose triple combination inhaler (Trimbow®) in a single pressurised metered dose inhaler (pMDI) for COPD patients. Trimbow met the primary endpoint showing superiority vs Ultibro® in reducing COPD exacerbations. Full study results will be released in the next few months. Parma, Italy, 7 September 2017 - Chiesi announces today the completion of the clinical study TRIBUTE with its extrafine formulation inhaled corticosteroid (ICS, beclomethasone dipropionate, 87mcg), a long-acting β2 agonist (LABA, formoterol fumarate, 5mcg) and a long-acting muscarinic antagonist (LAMA, glycopyyronium, 9mcg) fixed-dose triple combination inhaler (Trimbow®) for Chronic Obstructive Pulmonary Disease (COPD). The primary objective of the 52-week study was to investigate whether Trimbow® would be superior to fixed-dose LABA/LAMA combination (Ultibro®) in reducing moderate and severe exacerbations in COPD patients. TRIBUTE randomised 1,532 patients to either Trimbow or Ultibro. The primary endpoint was met with a significant reduction of moderate/severe exacerbation compared to Ultibro along with a comparable safety profile. Chiesi’s extrafine fixed-dose triple combination inhaler (Trimbow) has recently received a marketing authorisation from the European Commission following EMA Committee for Human Medicinal Products (CHMP) positive opinion. Trimbow contains three active ingredients, the anti-inflammatory inhaled corticosteroid (ICS) beclomethasone dipropionate, and two bronchodilators, the long-acting beta2 agonist (LABA) formoterol fumarate and the long-acting muscarinic antagonist (LAMA) glycopyrronium, delivered as an extrafine formulation in a single pressurised metered dose inhaler (pMDI). Paolo Chiesi, Vice President and Head of Research and Development of Chiesi added: “In two previous long-term studies, TRILOGY3 and TRINITY4. Trimbow consistently showed superior clinical efficacy compared to standard of care therapies with ICS/LABA and LAMA respectively on a range of clinically-relevant outcomes including exacerbations, lung function and quality of life. Along with TRILOGY and TRINITY, TRIBUTE provides evidence for Trimbow as a valid therapeutic option for those COPD patients in whom current standard of ICS/LABA treatments are not adequate to control their symptoms and prevent exacerbations”. For more information, please visit the Trimbow SPC at https://www.medicines.org.uk/emc/medicine/33828. COPD is a respiratory disease characterised by a persistent bronchial obstruction, associated with an increased chronic inflammatory response of the airways to noxious particles or gas. The classic symptoms associated with COPD are dyspnea, chronic coughing and chronic productive sputum. In some cases, an acute worsening of the abovementioned symptoms may occur, triggering COPD exacerbation. A double mechanism is at work in the bronchial obstruction in COPD patients: on one hand, an inflammation of the small airways together with the thickening of the airways walls and increased airflow resistance may occur. On the other, a progressive destruction of lung parenchyma (emphysema) associated with the loss of elastic retraction of the lung may take place. It is important to underline that both mechanisms may coexist, leading to a global airflow reduction throughout the lungs. 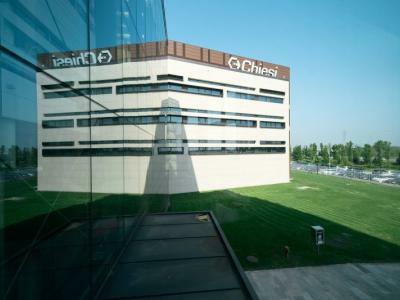 Headquartered in Parma, Italy Chiesi Group is an international research-focused Healthcare group, with over 80 years of experience in the pharmaceutical industry. Chiesi researches, develops and markets innovative drugs in the respiratory therapeutics, specialist medicine and rare diseases areas. Its R&D centres in Italy, France, USA, UK, Denmark and Sweden integrate their efforts to advance Chiesi's pre-clinical, clinical and registration programs. Chiesi employs over 4,500 people, 560 of whom are solely dedicated to Research and Development activities. 3 Singh D, Papi A, Corradi M, et al. Single inhaler triple therapy versus inhaled corticosteroid plus long-acting β2 agonist for chronic obstructive pulmonary disease (TRILOGY): a double-blind, parallel group, randomised controlled trial. The Lancet. 2016;388(10048):963–973.